Andi Mack on Disney Channel is right around the corner (or online now) and BSCKids got a wonderful opportunity to speak with Asher Angel who plays a love interest of Andi’s on the show. Asher plays a perfect Jonah Beck and we enjoyed seeing him in the show as we watched the first two episodes. Asher talks to us about all that is Andi Mack including some behind the set secrets. Raised in Phoenix, Arizona, Asher started his career by appearing in numerous theater productions including Mary Poppins, Peter Pan, The Secret Garden, Aladdin, and Into the Woods. Asher made the transition to the small screen and has appeared in series such as Criminal Minds and Nicky, Ricky, Dicky and Dawn on Nickelodeon. When he is not filming, Asher loves to play sports like football, baseball, and basketball, and also enjoys singing and playing guitar. 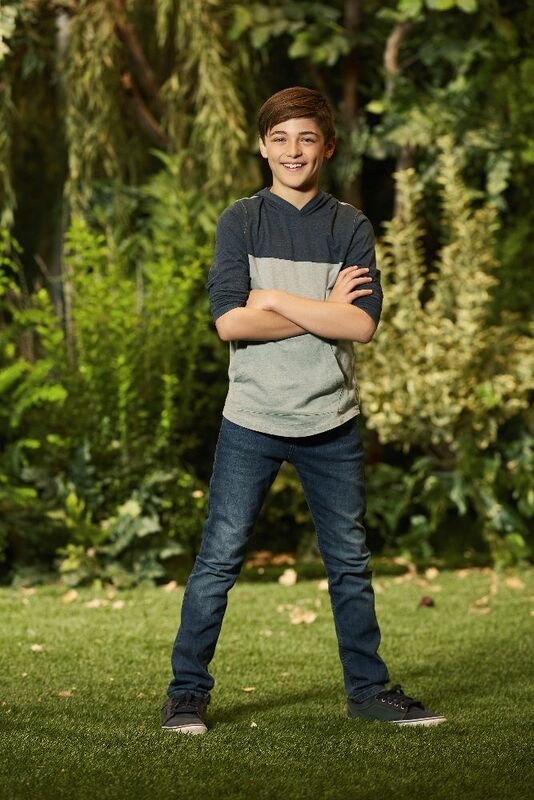 BSCKids: Asher, tell us a bit about your character Jonah Beck on Andi Mack? Asher Angel: Jonah Beck is Andi Mack’s popular classmate and the most intriguing boy at Jefferson Middle School. He is kind, sensitive, inclusive, the captain of the Ultimate Frisbee Team and Andi Mack’s secret crush. BSCKids: How did you get the role of Jonah Beck? How did it feel to be cast as the main love interest of Andi? Asher Angel: After a series of auditions, callbacks, testing and chemistry tests I learned that I was chosen to play Jonah Beck. Learning that I booked the job was exhilarating. It reinforced that all of the sacrifices my family made for me were worth it! Asher Angel: I take a minute to myself prior to filming to “get into character” – I review the scene and identify the emotional intelligence and awareness called for. BSCKids: How good were you at Ultimate Frisbee before you started the show and did you have to step up your disc game? Asher Angel: I was pretty bad. Production brought in a Ultimate Frisbee coach for Peyton and I. That was so much fun. My Dad and I would go home and practice with my brother and sister. I can’t wait to go to the beach to play! Asher Angel: It was everything I imagined in my dreams! Everybody involved in the process, those in front of and behind the cameras, were invested in making the show a success and I believe it shows. Peyton and I are the best of friends. In fact, I just spent my spring break with her and her family – they are like my adopted familyJ. It was the first time my parents let me fly by myself. My favorite behind the scenes story is the day we thought filming had wrapped. Peyton and I ate some airheads that turned our tongues blue. Then, Peyton was called to set for additional filming – with a blue tongue! That did not go over well and watching them remove the blue from Pey’s tongue was really funny. Those airheads were never on set again. BSCKids: Do you find it harder working in theater or the small screen and why? Asher Angel: Both platforms provide their own challenges. It would be hard for me to say one is “harder” than the other. The main difference is that theatre is live. So, if there is a glitch or technical difficulty the actors have to overcome it on stage in front of the audience. I remember when I was performing in Mary Poppins at the Phoenix Theatre my microphone fell of mid performance. I had to problem solve in the middle of my scene. It was scary and fun. I remember after the show my Dad told me he was really proud of how I handled that situation. BSCKids: This show is going to be something special and a bit different from other shows it seems. Without giving too much away, how is Andi Mack different? Asher Angel: Andi Mack takes an honest approach in discussing themes that impact children and families. The stories are authentic and relatable. Asher Angel: Absolutely. Andi Mack will show kids that they are not alone. Andi Mack will teach kids how to overcome issues they face and reinforce the value of self-expression and confidence. Asher Angel: I love to sing, play the guitar and piano. One day I hope to have an album out. Asher Angel: There are so many. I grew up watching Disney Channel and still watch it with my brother and sister. One of my favorites would have to be Austin & Alley. I loved the way they were able to sing in so many of the episodes. Asher Angel: Stranger Things. The actors are amazing and I would love to work with them! Asher Angel: I could not point to any one person. Even at my age, there have been so many people that have mentored or helped me become both the person and actor I am today. But I would say that my mom’s advice about theatre is something that I attribute to my success. She always told me that the best actors come from theatre. And since I wanted to be an actor I did as many theatre productions as I could. Looking back, I believe that experience led me to Disney and Andi Mack. Asher Angel: Instagram and the guitar tuner app. Special thanks to Asher Angel for taking time out of filming Andi Mack to talk to us. Make sure to tune in to the first showing of Andi Mack on Television on April 7, 2017.